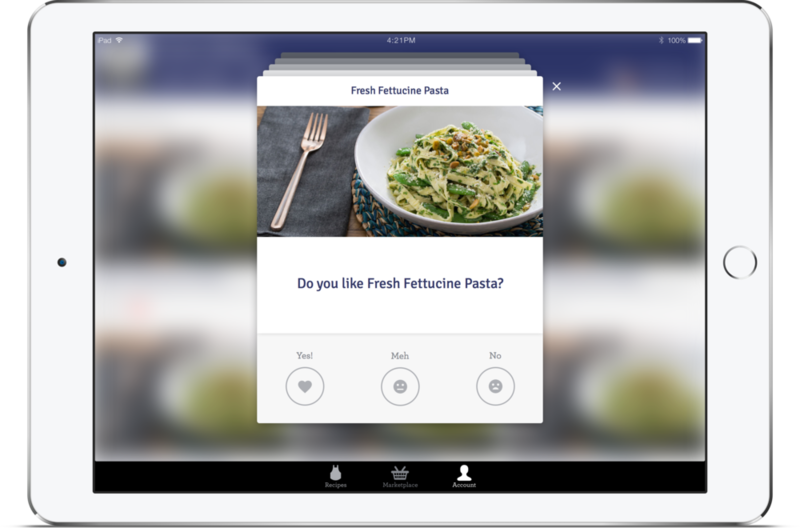 A conceptual design exploring the possibility of a Blue Apron iPad app for the kitchen. 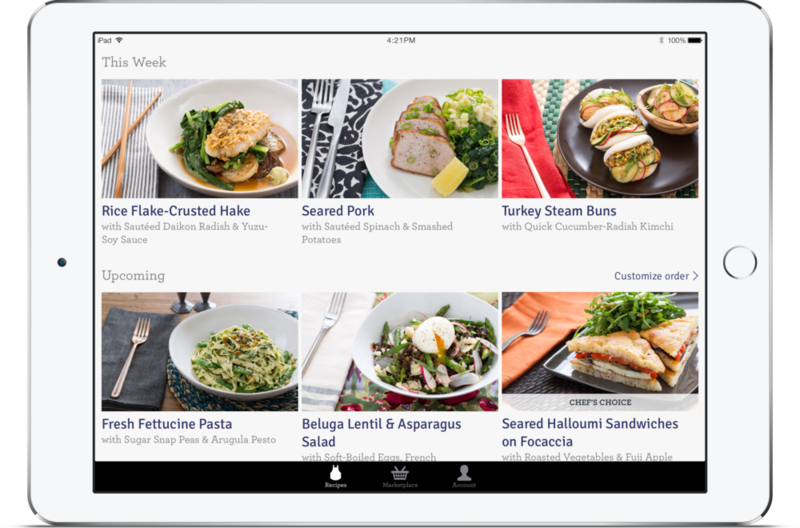 The following is a design project for a hypothetical Blue Apron iPad app. It was an opportunity to bring two things that I enjoy together and share it with you folks. Like many other recipe organizing and cooking apps, you will find similar functionality here. However, I believe it's the unique service and helpful information that Blue Apron provides that makes this app an experience of its own. I asked a handful of friends who have had a couple months of Blue Apron experience to share their thoughts on what could be improved. The biggest takeaway was the 1) formatting of the recipes and 2) getting more detailed instructions on key tasks that required specific cooking techniques. Browsing Facebook and Twitter showed a wide range of excitement, joy but also critical feedback about taste preferences. We start to see that delivery services like Blue Apron are bringing out the inner chef in many people. These proud chefs are posting pictures of their plated meals as comments on Facebook for others to see. Valuable feedback about recipes are shared online and give attention to how people's tastes may differ from one another. This can be useful information to the staff who are constantly developing new recipes that are meant to appeal to a broad range of people. Keeping the ingredients on a fresh rotation as well as scaling at their size is a challenge that requires close monitoring. They say food brings people together. That's very true in this case and is what will help bring people back to the service. Creating moments together such as cooking dinner offer a value more than just about learning new skills or tasting new flavors. It can also be about sharing an experience together from start to finish. Defining the user experience follows much of what I believe is Blue Apron's strategy: Help people become successful cooks by offering friendly resources that equip them every step of the way. People want to learn how to become better cooks. It's a process that takes time and skills to develop that everyone isn't always prepared for. That's why it's important for this experience to address cooking needs at all stages from inspiration to equipment and timing. It needs to be simple and fun. Otherwise, how else will you stick with it? 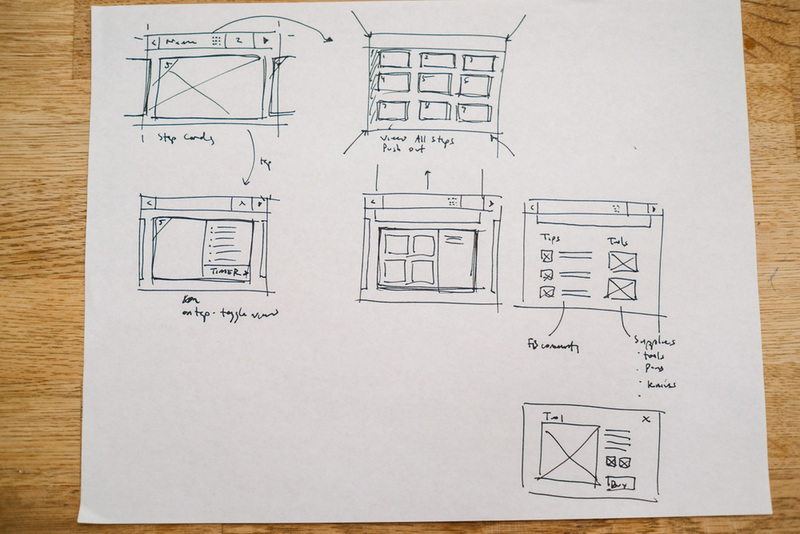 The card metaphor was key in determining the primary user interface for the recipe experience itself. They act as chapters that guides a user progressively through the different stages from start to finish. Once the person begins to cook, there is only going forward which minimizes the amount of thinking required during a attention constrained time while motivating people to continue. Supplementing the experience with improvements to the layout for easier parsing and tracking helped to address one of the outstanding pain points: blocky paragraph text. The approach made sense for print as it was used to overcome the limited amount of space on a single recipe card. However, we're no longer bound to that same constraint. Beyond Cooking. A Personal Relationship with Food. After some reflection, you can think of Blue Apron's mission extending beyond cooking itself and into the experience of our relationship with food. In order to fulfill our personal desires and preferences we have with food, we can look at how our choices shape our tastes. Understanding what we crave, what we order and then taste, helps create a much clearer picture of how Blue Apron's service can - over time - cater to the increasingly diverse profiles of their loyal chefs. So how might we accomplish this goal? To understand these variables, new additional features were imagined to capture personalization information whilst providing a differentiated experience from other grocery providers in the market. These concepts included voting to unlock new recipes, an easier method to customize orders and an intelligent rating system. 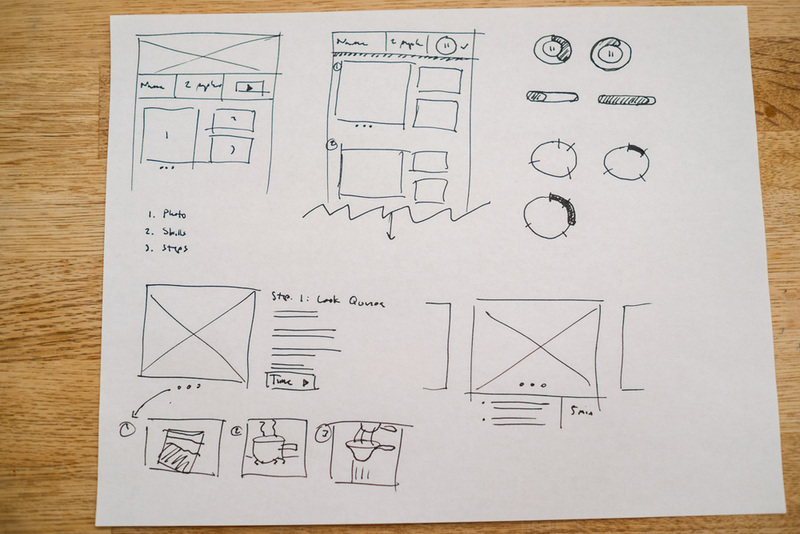 Combined, these ideas aimed to build a taste profile that understands intent and preferences. 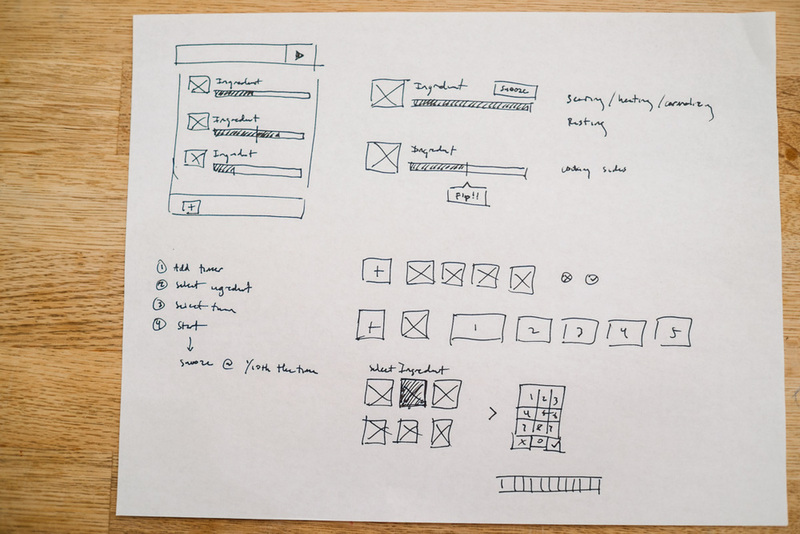 The challenge with the design was to create an app that was more than a typical recipe book. The app had to make Blue Apron user's lives easier, smarter and delightful all at the same time. Features within the app needed to map to the existing functionality that the website already offers today while taking advantage of some of the unique qualities of being a native app experience, Lastly, and most importantly, how can the app aid the user retention strategy and customer acquisition strategy at the same time? The core of the experience centers on food. The beautiful photos are the bedrock to exciting users with a broad spectrum of cuisines and ingredients. 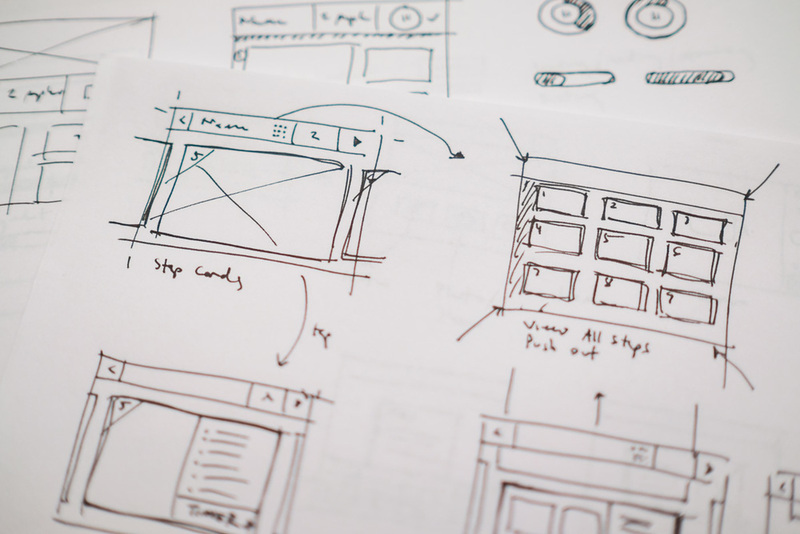 Throughout the experience, the user will find the same common element is the recipe and that all features are present to deepen the relationship between the user and the recipe. You can see from the screens that there are opportunities peppered throughout to engage the user around recipes. Each trigger offers some reward and the investment for their time can set the stage for more personalization. Cooking for the first time is frightening and inexperienced chefs needs clear and straight forward instructions. The direct translation of recipe cards as the primary interface offers many benefits. The interaction model is far simpler with a linear progression of steps and the user is able to see all the relevant information on the screen at any given time which reduces their cognitive burden. While the paper recipe cards offered all the information in a single view, it was hard to follow while cooking. Users would lose their place and spend time hunting to resume and interpret each step repeatedly. Those needing even more instruction would get stuck not knowing proper technique. Simple formatting updates like numbered lists make it easier for users to resume where they left off as they take their attention onto the ingredients in front of them. Including numbered lists makes it easier to recall where you are in the process. Links to helpful videos and additional images clarify how new chefs can complete the step. Bigger images with more detail makes at a glance even better. Not getting what you want can quickly sour the experience of a subscription based service. Making it easy to identify the best possible choices and fix them before it's too late can save people from jumping ship. Even allowing the opportunity to skip a week instead of quitting altogether can make a drastic difference. Here users can jump right into the details of their upcoming menu and customize it to select their preferred choices. If the delivery is already underway, then it becomes an easy way to track the delivery to ensure it is properly received. Managing upcoming meals ensure people are getting the most out of the service. Swap in more desirable dishes to make the most out of the week. Easily track inbound shipments with an accessible link to the tracker for updates on delivery. Users can take it a step further and influence future recipes by voting up on ones that the Blue Apron kitchen may be developing. There are only winners here and that's key to the experience. Recipes that reach a certain level of votes will become a "Chef's Choice" item which can then be selected as part of the custom order. The more the community votes, the more they are in control over what they get to cook (and eat)! Avoiding a winner / loser scenario prevents any form of animosity or regret from occur which could severely impact future engagement and participation. There are many reasons to get excited about what's coming up with Blue Apron but messages do get lost in mail. Some weeks don't satisfy all cravings and thus lose interest from users. Not all recipes are treated equally. Notifications from the home screen bring people back to the app and aware that upcoming recipes they care about are available. A chance for users to specify which recipes they're excited about. Direct line of communication and attention when good news happens immediately. More to look forward to than your typical subscription service. Shopping experience streamlined to be a part of the ongoing subscription service. Added items get delivered along with regular deliveries. Less friction browsing and buying items from the marketplace. Fewer steps to complete a transaction. Getting feedback can be a total drag with long surveys and general fatigue when questions get too complicated. That's where simple score cards can be used to capture useful responses from chefs who recently tasted a finished meal. Not only can these cards collect whether or not if the food was liked, but also tie to cook (difficulty), overall taste (satisfaction) and if they would recommend the recipe (value). Scorecards should be limited to a set few, but the questions themselves could be programmatic and promote different questions to capture desired responses to better decide on what to change. Text input can yield richer responses, but often requires more work on the user's end to generate them. Adding feedback can feel more like a chore. A stack of feedback cards capture simple responses according to different factors. Offering feedback can be fun and visual. A definitive number of cards can give users a goal to complete their task. Thank you's can show appreciation to encourage more participation. Being prepared is the best way to cook up a delicious meal. Understand your ingredients, learn useful techniques and stock up on necessary equipment. Cooking fresh, gourmet meals couldn't be any simpler with Blue Apron. Each recipe is accompanied with beautiful cards that steps you through every instruction with a single swipe. Built in timers help you remember when to check on your food making multi-tasking a piece of cake. Need to go back to a specific step? Need to hop forward? No problem. Get where you need to be in a single tap. Take a photo and share them with friends because you know you do. See how your plating skills match up to other #blueapron chefs out there. Copy your notes down on your experience trying out new ingredients. Jot down adjustments that better suit your taste and master your way to new cooking adventures. Find all of your meals cooked, liked, bookmarked and those you have voted for the future. You can also manage the usual details like delivery address and credit card information. Easy to follow answers gives the Blue Apron team even more useful information to provide better quality recipes and service. Share the love by passing out free meals to friends and family. Earn a little something extra for yourself as a thank you for spreading the good word. As a community, let the team know what you're looking for from exotic recipes to new ingredients you're simply eager to try out. Stay informed of when your delivery is on its way or when the recipe you voted up has been successfully chosen as the next item to add to your menu. Many reasons to get excited about Blue Apron. Get all the essentials to master your cooking technique. Browse a complete catalog of equipment and pantry items easily. Learn more about the manufacturers and their story behind quality and craftsmanship. It's never been easier to shop. Just add supplies that you need and they will be delivered to you during your next scheduled shipment. Everything comes through your existing subscription seamlessly.